U.S. officials say Al Qaeda chief was confident he'd be tipped off before an attack. Was he depending on Pakistan?. 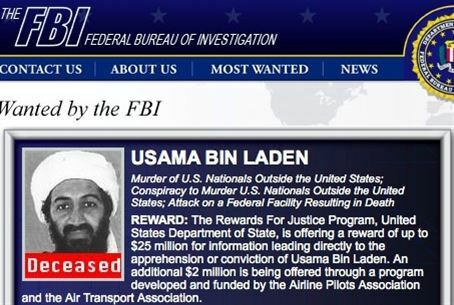 Osama bin Laden had cash totaling 500 Euros - about $740 in U.S. dollars - sewn into his clothing, along with two telephone numbers, when he was killed, according to a report on Politico.com. On the other hand, he was not armed. Top U.S. intelligence officials told members of Congress that these signs, taken together, indicate that Bin Laden was confident that he would be tipped off before any attack on his compound, and would have time to flee. The officials spoke at a classified briefing in the Capitol Tuesday. Politico.com added that three sources who attended the briefing confirmed the details, and a fourth source said he had been told the same thing outside the briefing. A White House spokesman refused to comment. CIA Director Leon Panetta told congressmen about the items found in Bin Laden’s clothing after he was asked why the Al Qaeda chief had not set up a larger security force to guard him at his Abbottabad home. One source said that Bin Laden believed “his network was strong enough he’d get a heads-up” before any military action against him was undertaken. Some congressmen are angry at Pakistan over the possibility that it was complicit in hiding Bin Laden, and want the U.S. to consider cutting off the large-scale funding to Pakistan. However, the White House appears to think this is a bad idea, and so do some influential voices on Capitol Hill. “You can’t trust them, and you can’t abandon them,” said Sen. Lindsey Graham (R-S.C.), the top Republican on a Senate subcommittee responsible for foreign aid. Pakistan is the only Muslim country with a nuclear military arsenal.